Fujitsu Laboratories claims to have developed a new infrastructure-as-a-service platform technology for its data centres that can configure and deploy physical servers on-demand on a per-user basis within 10 minutes. While virtual IaaS servers are typically deployed on-demand, physical IaaS deployments can take several days after being ordered by the customer because service operators need to manually install servers and software in the data centre. Fujitsu claims to have cut down the time by developing "Resource Pool Architecture" technology, which pools the various individual hardware resources, such as CPU, memory, and disk storage, before bringing them together over a high speed network to form part of an architecture created within a physical server. It conducted a test of the technology, which it says is a world's first, by creating a hardware resource pool of 48 servers and 512 disk drives and solid state drives. It was able to configure physical IaaS systems from the pool, providing physical servers to users, including operating system installations, in about 10 minutes. The company says this will give physical IaaS deployments the same flexibility as virtual IaaS deployments, in which several virtual machines share resources on the same server. 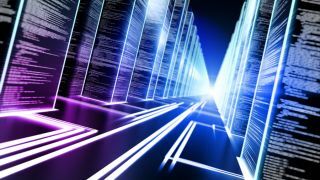 Despite allowing customers to use just the server resources they want when they need them, virtual IaaS produces a reduction in performance when more virtual machines are added as they are sharing the resources of the same physical server. Conversely, physical IaaS provides an advantage by introducing more resources in the form of a new physical server. Fujitsu Laboratories said it is beginning trials of the technology this month in a bid to study functionality and performance.